How many episodes of Dirt have you seen? Favorite show starring a "Friend"? A new generation of young professionals living at the infamous Melrose complex deal with obtaining their own personal goals, drives, and desires, both amongst themselves and others. The very first scene in the pilot of Dirt shows Courtney Cox as Lucy Spiller, a Friend-less tabloid editor who basically spits on everyone. 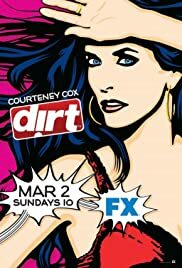 Now, that is the role I like to see Courtney Cox in. I hate to see her in the role of cutesy charming girl-next-door. She's stupid and annoying in those kind of roles. Lucy runs "Dirt" and "Now" Magazines, and she'll do anything to get her story, including blackmail, betrayal, maybe even someday, she'll resort to murder. That would be fun to see. What I like about Dirt is the way it's shot, it's just beautiful. I also like how Cox's character makes every pathetic little excuse for a human being cry. Her performance is to die for. And, even though I've only seen the pilot, I see no signs of slowing. It looks like it will keep getting better and better. The people on IMDb who have given this a "1" need to go out and watch some truly horrible programing. Because this is far from it. It's terrific and you should definitely watch it. 38 of 56 people found this review helpful. Was this review helpful to you?